White Beach, Timeson and Oakwood were frequent stops on the Schenectady-Saratoga Trolley line that once ran off to the west of Ballston Lake. General Electric employees and other visitors looking to recreate and relax on Ballston Lake frequented the trolley. Converted to a bikeway and walking trail, this flat and straight, asphalt covered path is a great destination for the whole family. 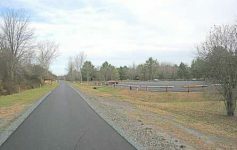 The trail stretches for three and half-miles between Outlet Road to Route 146A in the Village of Ballston Lake. As you ride on the trail, interpretive signs remind you of the past with information on the early settlers dating back to the 1700’s. The small metal trail markers every quarter mile are a convenient way to keep track of your progress. Active railroad tracks run parallel between the bikeway and the lake. A high bank on the east side of the trail provides a nice visual barrier for the tracks. Expect for the occasional train breaching the sounds of nature, the thick foliage around the trail gives you a feeling of solitude. My husband and I just did this bike path & found it very enjoyable! It was especially beautiful with the changing leaves…the colors were so vibrant and there were many fallen leaves all around. We also saw/heard many different creatures walking and foraging about in the woods along the path. We were delighted to see how friendly most of the passing walkers, runners and other cyclists were. 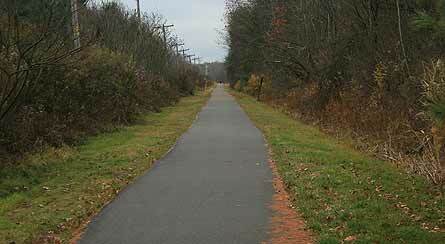 This is definitely a bike path we would come to again, and one we would recommend to others!